HKS Fuel Rail Upgrade kits are high-performance fuel delivery units that are designed to properly supply the additional fuel needed for high boost/performance applications. HKS Fuel Rail Upgrade kits are direct bolt-on replacements of factory fuel rails, and allow for larger top-feed injectors to be added. 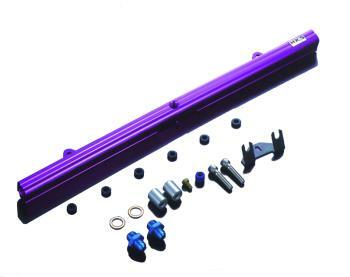 HKS Fuel Rails are machined out of aluminum and anodized HKS’ signature purple for durability and visual appeal.